Does Hedman 69890 fit your vehicle? 69890 is rated 4.0 out of 5 by 2. Rated 5 out of 5 by Meltondjy from Great Headers The HTC costing and fit of these headers is excellent, it actually makes a difference keeping the underhood temps down and they still look like new. These are way better than painted headers that smoke like crazy when you first use them. What is the difference between these and the standard duty headers? And does it affect performance? 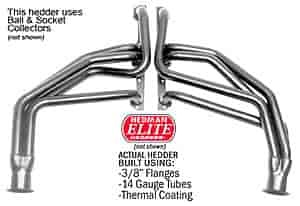 The elite headers have a thicker flange and a thicker gauge tube, this will allow them to last longer. The performance is the same as a standard header.